Layering beds has been a thing for a while, but all of a sudden it needed to happen at my house and it needed to happen RIGHT NOW! I hit up Pinterest for ideas on how to make this work. I found these blogs to be most helpful, Just Decorate and The Budget Decorator. 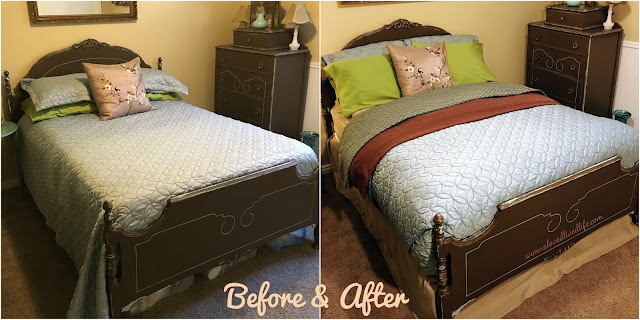 After scrolling through Pinterest pins on the subject until the wee hours of the morning, I raced out and bought a new bed skirt for the guest bedroom and check out the end result! I did this with bedding and pillows I already had. The only thing I needed was a bed skirt to hide the wrapping paper underneath the guest bed. I think you can see from the before and after that the bedding needed a little help. I love that simple change can make such an impact. Do you have layered bedding you'd like to share? Post a photo in the comments!